You are here: Home / Articles / Cork My Wine Please! Like many, I enjoy popping a real cork out of a bottle of wine. It’s just a personal preference of mine, if for no other reason than I simply like corked wine. Wineries have a wider range of views on this subject. Some feel that since cork is a natural material, thus subject to nature’s inconsistencies — some cork can taint the wine and rubber corks will protect against this. Although who really knows what’s in that synthetic cork that’s touching your wine. 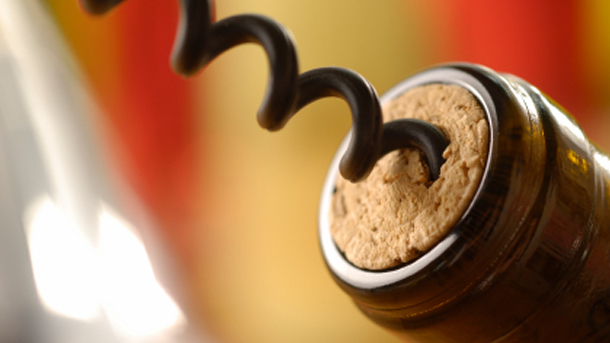 Screw tops can prevent air – and thus oxygen, from seeping into wine. Exposure to air oxidizes the wine. So an opened bottle of wine with a screw top back on, will allow it to last maybe a few days longer than with a cork back in it. And most of all, there’s the cost factor. There is a difference between cheap corks and expensive corks which can run about $1. each. These are made from the best quality cork wood and have small holes that let as little air in as possible. Using cheaper corks can be OK for cheaper wines, a screw cap works much better yet than going with a cheaper grade of cork… and costs even less. That being said, there are pricey screw caps out there, and you’re starting to see them on better wines. Contrary to what many think, a screw top does not by any means signify a lower quality of wine. I have had several outstanding bottles of vino with screw tops – some of which are my favorite. Now there are downsides to real cork as well… such as cork pieces ending up in your bottle. Oh the frustration! I must confess, I’ve had my share of corks breaking or crumbling into bottles… NOT a happy way start to what should be an enjoyable experience. But, it’s still always been more of a personal preference for me to wanting a real cork in my bottle. I save all of them… the one’s that don’t break, and have a great collection of corks that my wife beautifully displays in lovely Pottery Barn glass urns with candles. They make wonderful center pieces on the dining table. You can make some lovely cork boards and hot plates as well. The possibilities and benefits beyond the bottle are endless! 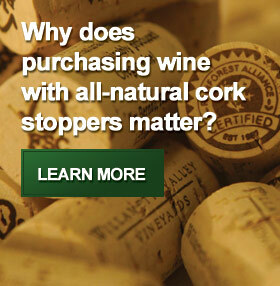 Fact is that most wineries are trying to save money, and while they will tell you different reasons on why rubber or screw caps are what they use — for the most part real cork is just too costly today. Now I’m far from an expert on this subject — all I can say is I simply prefer corked wine. Maybe it’s just that removing a screw cap from a bottle doesn’t provide the same grace and flair of pulling a cork and hearing that pop. But, after my learning a bit more about natural cork, my preference for it has grown even more. While the debate will continue, let me be clear – I am still more concerned with what’s IN the bottle and the quality of it, than what’s being used to seal it up. Cork is a natural, renewable, recyclable and biodegradable material that is obtained through an environmentally friendly harvesting process. Trees are not cut down to harvest cork, rather, the bark is stripped by hand every 9-12 years. Cork oak trees can live up to 300 years! Approximately 6.6 million acres extending across Portugal, Spain, Algeria, Morocco, Italy, Tunisia and France, the cork oak forests support one of the world’s highest levels of forest biodiversity, second only to the Amazon Rainforest. Unlike natural corks, many synthetic wine corks are made from materials that are not biodegradable. Disadvantages of synthetic corks include, a risk of harmful air entering a bottle after only 18 months, as well as the difficulty in extracting them from the bottle and using the plastic cork to reseal the wine, and that some can also impart a slight chemical flavor to the wine. Visit the Cork Forest Conservation Alliance at CorkReHarvest.org for much more information on this subject.